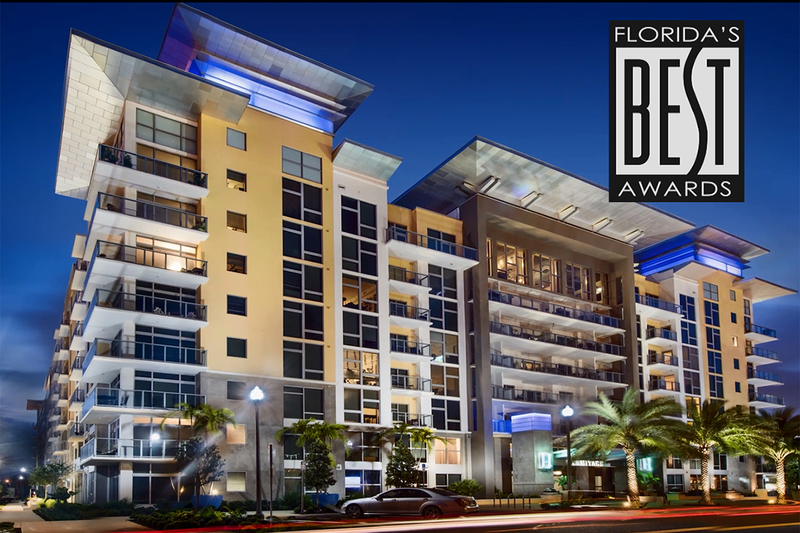 The Hermitage Apartment Homes, a luxury multi-family apartment community in downtown St. Petersburg, Florida, garners first place accolades at the 2018 Florida’s BEST Awards, presented by the Builder’s Association of South Florida (BASF) in the category of online Builder’s Overall Multi-Family for Rent Average Monthly Rental $1801 to $2500. The Florida’s BEST Awards celebrate professionals from leading industries, including developers, contractors, architects, interior designers, landscape architects, marketing specialists, mortgage and real estate brokers. Entries are judged by top industry professionals. The awards gala, which had nearly 600 industry related leaders in attendance, took place on October 13, 2018 at Jungle Island in Miami. Designed to be a centerpiece in a city that continues to grow into a thriving activity center for urban dwelling residents, The Hermitage Apartment Homes, located at 151 7th Street, is set in the heart of downtown St. Petersburg’s lively Central Arts District, the Waterfront Arts District and the city’s medical and university campuses, retail shops, art galleries and museums are just minutes away. Surrounded by lush landscaping, The Hermitage Apartment Homes boasts 348 spacious studios, as well as one- and two-bedroom rental residences within the eight-story building that also showcases celebrated artwork throughout the building’s main lobby; paying homage to the Hermitage Art Museum in St. Petersburg, Russia. A dedicated gallery space in collaboration with the Morean Arts Center is also featured, which displays and celebrates works by local artists. Additional building amenities include resort-style services, rooftop pool and spa, outdoor grilling area, fitness center, pet spa, bike shop and storage as well as private dining and meeting areas with expansive bay views. Residences feature open floorplans and kitchens complete with granite countertops, two-tone cabinets and stainless steel appliances, walk-in-closets, an abundance of storage space as well as washer and dryer in each apartment home. The Allen Morris Company is one of the largest real estate firms in the Southeast U.S. specializing in commercial, multi-family residential and mixed-use developments, leasing and brokerage as well as property management. With offices in Miami, Coral Gables, Fort Lauderdale, Orlando, Jacksonville and Atlanta, The Allen Morris Company has served its business and investment clients for over 60 years. For more information, please visit http://www.allenmorris.com or follow us on Facebook at www.facebook.com/TheAllenMorrisCompany or on Twitter @allenmorrisco.